Every year, between 11,500 and 13,500 kilograms (25,000 and 30,000 lbs) of apples are sold to a hungry public. Over 60 varieties of heritage, new and “tried and true” varieties are available, grown both conventionally and organically. These include the heritage apple ‘Grimes Golden’ and ‘Ambrosia’, recently discovered in Cawston, British Columbia. Also available for sale are many varieties of apple trees grafted onto dwarfing root stock, perfect for the home garden or patio. One of the most popular activities at the Apple Festival is apple tasting. 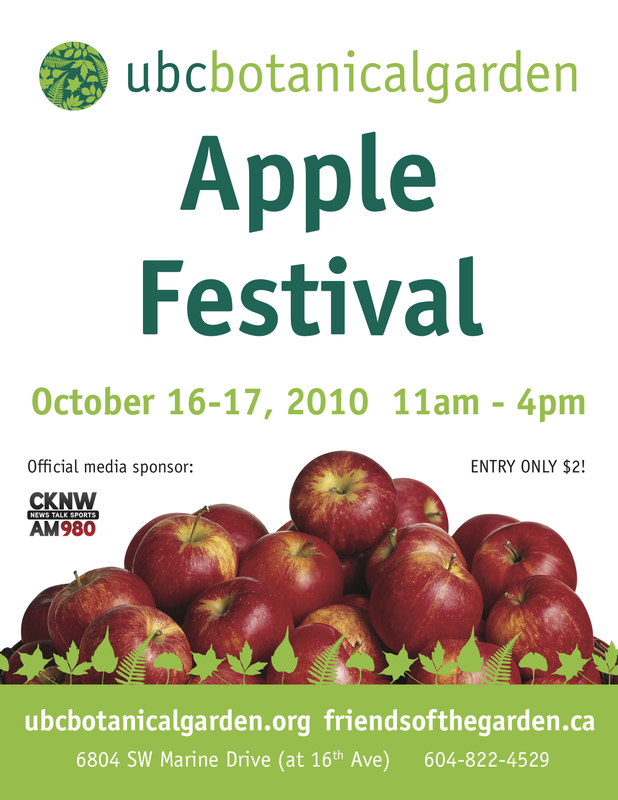 For $3.00, curious eventgoers can taste up to 60 varieties of new and heritage apples grown in British Columbia. Learn the history of those varieties from the Friends of the Garden’s “published in-house” Apple Booklet.